ISO has been working on creating a graphical notation for Topic Maps for some time now, and now the first proposal for level 1 has been published. (Level 1 is the ontology part; there is also a level 0, which is the instance part.) This is not a formal draft, just a simple slide show explaining the formalism, so it should be easy to read for anyone who's interested. This is the first step towards creating a standard, just coming up with something so people can say whether they like it or not. If the community approves it can be taken forward and a proper draft made; if the community does not approve a different proposal will have to be put together. 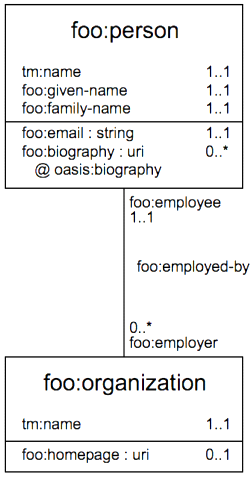 This proposal is based on UML, and tries to keep everything as simple and visually compact as possible. It's based on UML because most people seem to use something similar anyway (boxes with names in for topics, lines for associations), and this is in any case the most obvious route. It aims at compactness because my experience is that once you create some non-trivial models visual real-estate quickly becomes scarce. The figure on the upper right shows an example model from the proposal that's explained in the proposal, but basically it defines two topic types with name and occurrence types, and an association type connecting them. Anyway, please study the proposal and let us know what you think, on the mailing lists or elsewhere. You can also find more information on the GTM homepage. The proposal will be discussed at the ISO meeting in Montréal in early August, and at that meeting the committee will decide in what direction to take GTM further. Your input might help the committee make the right decision. Nice, will there be an option in Ontopia to draw these for me? Longer-term I hope we will make such a tool, yes. It's not going to happen before GTM is stable, though. How long that will take I can't say at this stage.